Let's get started on today's discussion! Now, I gotta admit, when this was the book that was chosen, I was a little concerned. I was afraid this book would be full of theories and research and not actual useful information. Boy was I wrong! I am LOVING this book and we are only on the introduction! Here's what I took away from this week's reading. Oops! Ha! At least I was on the right track. I think it's so important to focus on disrupting our thinking because when we do that, it opens up so many possibilities. We as teachers have to start thinking this way, right? If it isn't working, it's time to disrupt the system and figure out a better way! The most important take away I had from this section was from the part from Bob's article that he wrote after September 11th in which he discussed how students would (or wouldn't!) learn from reading difficult texts. He said that students wouldn't learn to read difficult texts by "taking quizzes or preparing for them, or by collecting points and prizes for numbers of books read, but by engaging stories and poems that touch them, reading them in the company of other students and committed teachers who will help them make connections, explore responses, and raise and answer questions." This might just be my favorite part of this week's reading. I am so saddened when kids talk about how many AR points they have or ask to read an "easy book" because they need so many points to meet their goal. Ugh. Did y'all agree with the teachers' response to the author's question about what they wanted most from their students in terms of deep learning? The teachers said "apathy," that students are "just going through the motions, getting good grades even, but nothing is sinking in." I SO agree with that! So many of our students are not interested or concerned with enjoying the story or looking for meaning in the story or connecting with characters from stories. They just want to read the text, answer questions about it, and then take a test. We have got to change this way of thinking and make kids passionate about reading! This brings me to the section about part one. I absolutely loved reading the snippets of conversations from the students that varied in age from first grade to college. Isn't it interesting to see how the students' opinions on reading changed as they grew older? I wrote "YIKES!" out beside the convo the author had with the 4th grader. I hate that the student only enjoyed reading on Fridays when they got to read whatever they wanted...but only if no one had misbehaved that week. Oh goodness gracious! How sad is it that. I felt for that kid. We have to put our students in the right mindset and promote a love of reading. We need to strive to eliminate all the "fake reading," which is an art that so many of our students have mastered, right?? Okay, that's it for my thoughts. Now I want to hear YOURS! If you want to comment here, that's great, but I will also post a picture on Instagram and Facebook tonight at 7pm CST if you want to comment and discuss there! Whatever works for you! I'm super excited to read on to chapter one! Here's the revised posting schedule if you need it. Thank you for hosting this professional development reading! I already love this book. I can't agree with you more with your ideas on apathy! I don't want my students just going through the motions. I want them to love reading. 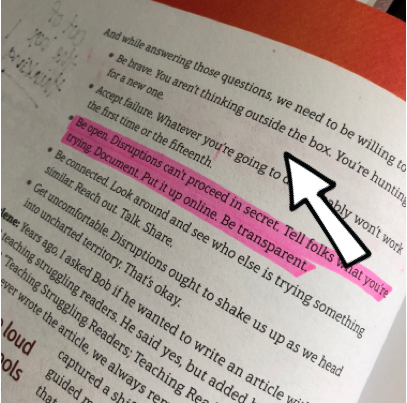 I have published my own thoughts on this week's reading in my own blog post ( https://thetigerstale.weebly.com/blog/disrupting-thinking ). Thank you for choosing this book as a book study! I started it over winter break, but didn't get very far, so I'm happy to revisit it. I totally agree with the "apathy" answer by teachers. I teach 5th grade and kids just seem to go through the motions of reading. I hope that throughout the year my enthusiasm for reading inspires the kids a bit, and I do see a change in some readers, but I'd love to find ways to keep connecting and encouraging the love of reading in ALL students. I use a "status of the class" at the beginning of the year to keep track of progress, but typically by Thanksgiving I can't keep up with 31 kids. 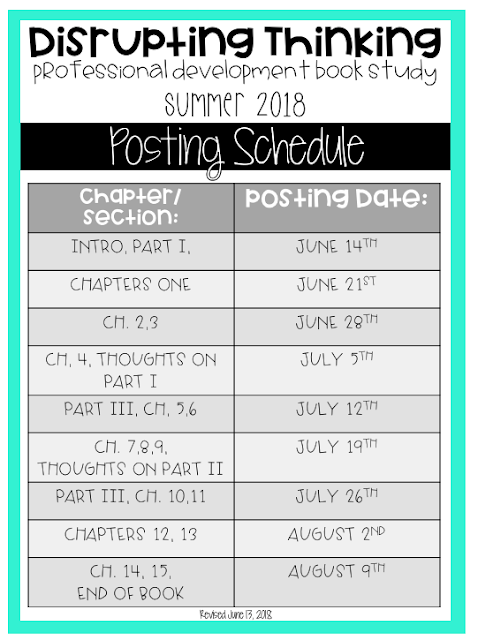 I'm hoping this year with only 25 (we've added another section so we'll have 5 fifth grade classes instead of 4), I can keep up on the "status" and actually have time to check in on readers and why they're switching books, or not progressing. Yes! I feel so encouraged by the progress of some kids in regards to their opinion of reading, but I want to find a way to reach ALL the kids! You're right...they are just going through the motions and eventually they will become "fake readers" if they aren't there already! What do you do for "status of the class"? Do you have an example of what this looks like. Sounds interesting! Status of the Class is a quick check in with every kid about what book they're reading and what page they're on. I would do it at the beginning of each guided reading group. It's from Donalyn Miller's The Book Whisperer. This book really surprised me. Like you, I had my doubts that this book would actually give practical applications to the classroom, but I am already impressed. As I was reading the student responses, my heart broke for the students who weren’t allowed to read whatever they wanted. I try my best to get to know my kids in order to be able to reccommend books that they may fall in love with. Sometimes I wonder if one year is enough to make them passioniate about reading. I don’t want it to be about passing a test or finding evidence even though I am definitely guilty of thinking about reading that way sometimes. I can’t wait to dive into this book further to see how these ideas can be implemented into my classroom! Exactly! I don't want them to think reading is all about passing a test because it's so so much more than that! That way of thinking is so hard to overcome for middle school children though! As an intervention specialist (being in many classrooms), I see the progression from grade 1 to grade 6 that demonstrates a decline in the love of reading. Due to the pressures teachers are under for testing every book and article becomes a set of questions to answer. We need to promote more discussion among our students and find other ways to get a "grade". I’m getting my master’s in reading and the authors of this book, Beers and Probsts other books have been assigned to me. They are highly respected and informative on their thoughts. They are so right about what reading turns into as they progress in school. All text-based responses and not enough inferential thinking and opinion to reading. Reading is much more than fact regurgitation. I started this book back in the fall but due to assignments for classes and others this got left behind. I’m glad you are hosting this. It’s hard to find teachers that enjoy professional development books. I’m excited about sharing our thoughts about this book. Thank you for giving me a reason to finally crack open this book. My school district purchased it for every school, but I hadn’t previously made the time to read it. I teach in Canada, and some eye-opening fb posts have given me an awareness of how different our two countries’ education systems have become. One of the common US requirements that blows my mind is this “I need to collect two grades per week, per subject” rule. The only assessment that can be done at this rate would be really low-level stuff, easy to mark, but also nothing creative, or thoughful, or even comprehensive. And if you are having to mine grades all week, of course kids will extrapolate that that kind of activity is valuable. It would seem to mean that this type of required assessment will shape classrooms into fact sheet mills. Am I mischaracterizing the challenges that you are facing? I am an instructional coach and I do feel like teachers often assign worksheets and low level assignments because they have to meet their quota of grades (I am in Texas). I have heard teachers complain that this takes away from more meaningful and higher level activities. I bought this book last summer but ironically, couldn't get motivated to read it on my own! I'm so glad to be part of this online book study; even though it's optional, it gives me a focus and a purpose. I teach 5th grade, and I've been amazed the past few years about how my kiddos HAVE been motivated to read when it comes to their INDEPENDENT reading choices. We don't do anything like AR or reading logs, so it really has been just an expectation to have a just-right book (either from our classroom library, school library, or kids bring from home/public library). I can attirbute kids' motivation to maybe a few students each year that have been super avid readers, and their excitement spreads. Also, our school librarian is amazing, recommending books to kids, borrowing books from other libraries, etc. I sometimes have kids reading the same genre or rereading favorites, and I never really know what to do about that. Now, when it comes to reading for "school work," I guess I'd be curious to know what my students think about the various texts that we read and why we're reading them. My colleagues and I try to choose high interest pieces, and of course we have specific skills and strategies we're focusing on. We are clear and specific as to our reading focus/purpose, but I wonder if I'm making enough connections to their independent reading and WHY these skills/strategies are important. This is the "how kids read" that I'm excited to get into in the rest of this book! I am so excited to share thoughts about this book with everyone. I am looking for every excuse to impact change in my district, and I feel that this book is my disruption! I agree that students are apathetic, but when it comes to reading, I feel like there is also a general lack of empathy and sympathy as well. Being able to feel what characters are feeling, and feel things like dangerous settings/situations are what makes students fall in love with reading. Testing and evidence based questions have far outweighed questions that allow students to make connections to books. Rarely do we want to know what kids think about what they are reading, so they no longer feel. When they author discusses this on pg 10, I finally feel validated in what I have been trying to do this year, but to no avail. How do I get them feel for a book so they can deeply comprehend? It seems that as the kids get older, the joy of reading goes away. It sounds like in the older grades kids aren't allowed (given time to) read for fun during their school day, which for some kids is the only time of day they have access to a wide range of books. In elementary school, most kids have a designated quiet reading time (DEAR, SQUIRT, etc.). When the kids start transitioning from class to class in middle school, the freedom to schedule a quiet reading time goes away. When kids aren't allowed or encouraged to read for fun, they will only read to complete an assignment (read for work). Eventually, they will equate reading with work, and therefore no longer see it as something enjoyable. I absolutely love this book. I had read it once and am going back trough it with you. I have a 12 year old granddaughter that stays with me during the summer. I have asked her opinion on some of the advice in the book about how to ask the kids questions. She says it is so much better than reading and just answer questions on paper. I am hoping to convince my fellow teachers to use this technique. On to more reading. I am so excited to read this book. 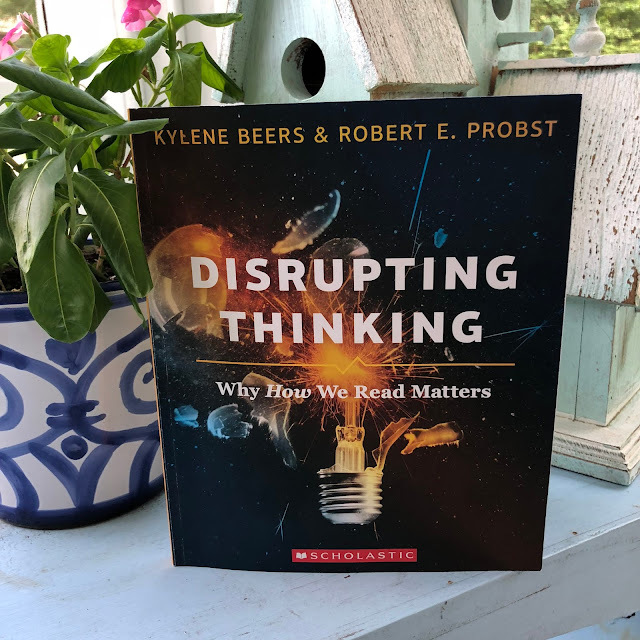 One thing that stuck with me so far is from the very beginning of the book in the description of what Disruptive Thinking can help students become readers who are "responsive, aware of her feelings and thoughts as the text brings them forth. She is responsible, reflecting honestly about what the writer has offered & how she has reacted, willing to either hold fast or to change, as reason and evidence dictate..." That type of reading really speaks to my teacher and reader soul. It inspires me to hold fast to my desire to teach students to be lifelong readers. I love seeing everyone's input and appreciate the opportunity to participate in this discussion with you all. I am loving this book too! I agree with the teacher that apathy has become such a barrier for our students love of reading. So much focus is on testing that enjoying and deeply discussing reading is gone. The snippets of conversations with students about whether they liked to read were heartbreaking. I can remember enjoying reading all types of books as a kid, but remember when reading for enjoyment went missing... middle school. My biggest takeaway from the introduction and part 1 was to change the mindset for reading. I loved the quotes from page 7, "disruptions start with a thought that something needs to be better" and "we rarely know just where they will end."